Sustanon (4 testosterones blend) is a strong anabolic with pronounced androgenic activity. It is mainly used as a bulking drug, providing good gains in strength and muscle mass. A rapid increase in body strength and an even increase in body weight occur. Sustanon is designed to provide a fast, extended release of testosterone. It is noted as being slightly more tolerable than cypionate or enanthate. Regularly stacked with just about everything: stacks extremely well with the potent orals Anadrol and Dianabol. On the other hand, Sustanon may work better with trenbolone or Winstrol if the bodybuilder were seeking to maintain a harder, more defined look to his physique. 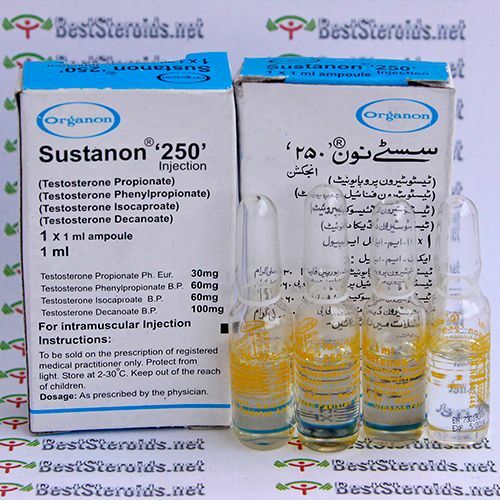 Sustanon will remain active in the body for up to a month after your last injection was given. Many bodybuilders like to use a combination of Nolvadex & Proviron and/or HCG, while others use an anti-aromatase like Arimidex to help control estrogen related side effects. An effective dosage ranges from 500mg a week to 1000mg weekly. Love these guys. Sustanon is an awesome and real product. Running it with Boldesim and seeing significant results within 2-4 days both in muscle size, quality, strength and endurance. Ordered 50 amps and got 4 free! Great job and keep up the good work! Great products, gained 20lbs in last 2 months. Slight pip from sust but manageable, never tried novocrine products but the dbol was legit. I was taking 50mg split into 2 doses... had to reduce to 40 because blood pressure jumped to high causing headaches. Oral tren is super strong night sweats on first night but incredible gains in strength and fat loss. Organon makes the best quality Sustanon hands down.. If you have never tried Sustanon I suggest it for any bulking or cutting cycle. I'm running 1 amp sust a week with 150-200mg of Novo Tren Ace.. Working great. It's a human grade pharmaceutical quality. You can't find a product as clean and exactly dosed as this. Injections are quite smooth (mild pip) even though it has the propionate ester in it. 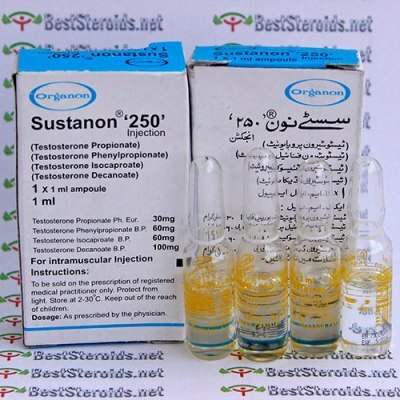 When it comes to steroid standards sustanon 250 is one of the best if not THE best there is period.